2018 CELEBRATES OUR 41ST YEAR!!! Coral Springs Craft Guild began as a way to promote crafts in Coral Springs. In the last 41 years, the Guild has become an organizational member of the cultural community. Since its enthusiastic beginning, the Craft Guild has had many energetic and accomplished members on its board of directors. They have all helped guide the group to its present reputation as a quality organization. The Guild is a not for profit organization comprised of talented crafters and artisans from several counties. The purpose of the Craft Guild is to improve the quality of hand-crafted items sold in the area, stimulate creativity in design and use of materials, provide an outlet for the exhibition and sale of members' work, enhance fellowship within the crafting community, and interact with the community through scholarships and community service projects. Since 1984, the Guild has awarded over $60,000 in scholarships to high school seniors who are pursuing further education in the arts and craft-related fields. The scholarship program is open to seniors from Coral Springs high schools, seniors who live in Coral Springs, and children of our members who are seniors at other high schools. In 2018, we will be awarding two scholarships! Our major events each year are a Spring function and our Holiday Show which features beautiful, top quality hand-crafted items. Due to our fine reputation for quality crafts, our show is very well attended. The Guild holds a general meeting on the third Wednesday of each month (except December) at 7:00 pm at Cypress Hammocks Park, 1300 Coral Springs Drive, Coral Springs. The meetings are open to the public and feature make-and-take home projects or a demonstration by an accomplished artisan. Over the years, along with our scholarship program, our community service projects have included making blankets for newborns and for nursing home residents, creating thank you cards for our military servicemen and women, collecting school supplies for children, making hygiene kits for the homeless, teaching art projects to children and adults, knitting and crocheting red infant hats for the American Heart Association, donating tree seedlings to Coral Springs after hurricane Wilma, providing Ronald McDonald house with art supplies, pop-tops, and toys and games, donating baskets of handmade items for raffles at cancer fund raising events, collecting pounds and pounds of canned food for local feeding programs, doing art rprojects at SOS Children's Village, and much more. 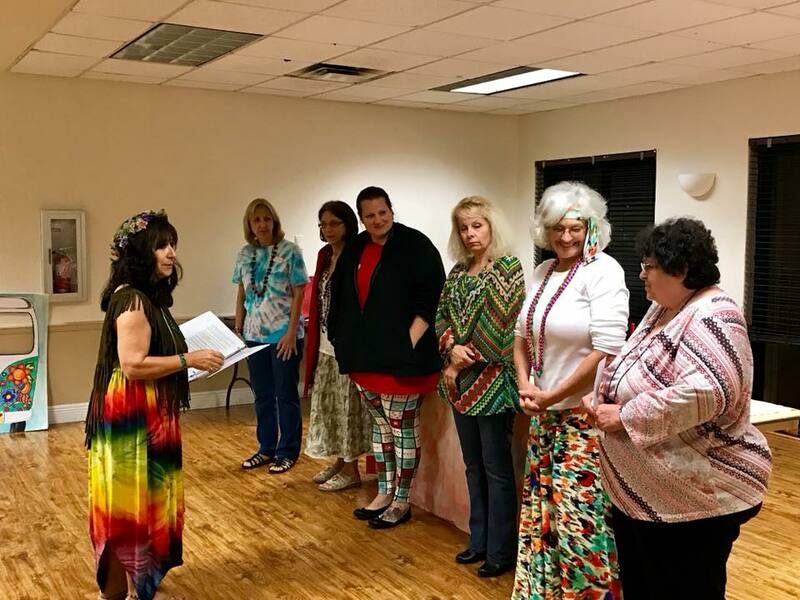 Our 60's Hippies themed installation of officers!